Schroon Lake; Alice T. Wanits, 90, passed away peacefully Sunday January 15, 2017 at the Pines in Glens Falls, NY. Alice was born May 13, 1926 in New York City, NY the daughter of the late Joseph C. and Margaret Logan. Alice was predeceased by her husband Frank Charles Wanits, brother Edward Logan and grandson Jeffrey Welch. Alice was employed for many years at the Continental Insurance Company in Glens Falls, NY. 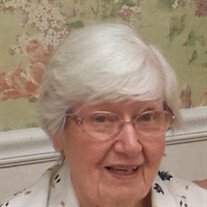 Alice was an active parishioner of Our Lady of Lourdes Catholic Church in Schroon Lake She was an avid gardener and enjoyed various arts and crafts. She believed in the power of education and volunteered at the Schroon Lake, Central School in their reading programs. She loved spending time with her friends and was sorry to move away from them. Alice is survived by her children, Theresa Palmer (Charles Rhatigan), Allison Welch, Charles (Lisa) Wanits, Corinne Wanits (Steven Horton), Galen (Denise) Wanits and Nicole Wanits Strothenke, sisters-in-law Dorothy Logan, Evelyn Ligon, 9 grandchildren and 2 great grandchildren and several nieces and nephews. A Mass of Christian Burial will be offered Friday afternoon January 20, 2017 at 1:00 PM at Our Lady of Lourdes Catholic Church on Rt. 9 in Schroon Lake. Interment will take place at Our Lady of Lourdes Cemetery in the spring. Friends may call at the Edward L. Kelly Funeral Home 1019 US Rt. 9, Schroon Lake Thursday January 19, 2017 from 4:00 until 7:00 PM. The family suggests memorials take the form of donations to the Schroon Lake Emergency Squad, Schroon Lake, NY 12870.